Obesity Linked To Lower Grades Among Teen Girls : Shots - Health News The reason for the link isn't clear, but researchers say obesity's effect on self-image and self-esteem might be partly to blame. Childhood obesity has made it to the forefront of public health issues, both in the United Kingdom and in the United States. Now researchers at the Universities of Dundee, Strathclyde, Georgia and Bristol say that not only does obesity affect a child's overall health, but it may also lead to poorer school performance among teenage girls. Among boys, the link is less apparent. Since the 1990s, the U.K has seen childhood obesity rates grow at an alarming rate, says John Reilly, specialist in the prevention of childhood obesity at the University of Strathclyde, and the study's lead author. Today, nearly a quarter of children in U.K. are obese by the time they reach 12. Increasingly, researchers in both the U.S. and the U.K. have been interested in how obesity might affect students' academic achievement, but Reilly says few studies have examined the same students over several years, or been able tease out obesity's effects from the influence of social factors, such as socioeconomic status. Are Americans Getting Smarter About Obesity? 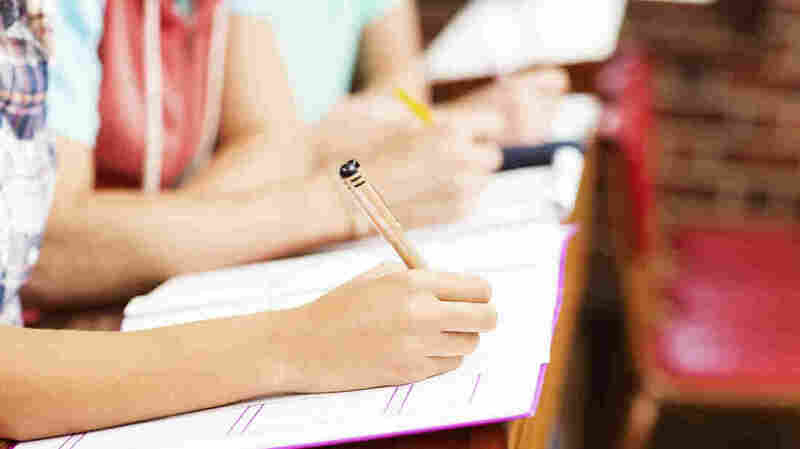 The current study analyzed data from nearly 6,000 adolescent students in the U.K., comparing their body mass index from ages 11 to 16 with how well they performed in standardized tests during those years. About 71 percent of the students surveyed were of a "healthy weight" at the start, the researchers said, and about 15 percent were obese. The academic exams, which tested the students' English, math and science abilities, were given three times — at ages 11, 13 and 16. After adjusting for factors like socioeconomic status, IQ and menstruation cycles, the researchers found that, on average, girls who were obese at age 11 performed worse at age 11, 13 and 16 than girls deemed to have a healthy weight. Being obese at 11, the scientists found, was enough "to lower average attainment to a grade D instead of a grade C," by age 16. The strength of that effect can mean the difference between passing a class and failing it, says Reilly. He and his colleagues focused on age 16, he says, because that's about the age that "determines whether you will do well after 16 — and whether you will go on in college." The results were published Tuesday in the International Journal of Obesity. Though the study followed British teens, Reilly says the findings are likely also applicable to students in the United States, where the proportion of children between the ages 12 and 19 who are obese grew from 5 percent in 1980 to nearly 21 percent by 2012. "The similarities between the environment, the culture, [and] school systems between the U.S. and the U.K. are more similar than may be obvious," Reilly says. "There is nothing about this [study] that is specific to the U.K.," agrees David Katz, the director of Yale University's Prevention Research Center, who wasn't involved in the study. For example, one 2012 study of more than 6,000 boys and girls in elementary school in the U.S. also found that obese students performed worse on math tests. The reason behind such a link, or why it consistently seems more prevalent among young girls, has yet to be determined, Reilly says. But other studies suggest the stigma of obesity and its effect on mental health in young adults may play a large role. "Girls are much more affected by obesity in terms of mental health and well-being than boys are," he says, adding that stigma's negative effect on things like self-image, self-esteem and even depression may be lead girls to skip school more often, leading to poorer grades. "The issue with girls," Katz says, "is that they're much more subject to the peer pressure and ridicule associated with obesity." The link between obesity and grades likely goes both directions, Katz adds. That is, poor academic achievement also could contribute to obesity. "If you're rewarded with grades and success, then you're less dependent on fries and cheese doodles, frankly," he says. "And if your [grades] are not good or rewarding, you don't have to be depressed to be frustrated — and for your self-esteem to plummet. And food may be a solution [you turn to]." But there are a slew of other factors that might also explain the link — including the ways sleep problems in obese teens can impair school performance and brain function, and the findings that peers tend to influence each other's weight. "We tend to isolate factors," Katz says. "But likely ... everything that happens influences everything else that happens." The best strategy, at least in the U.S., he says, is to address the root causes of obesity from a cultural level. "We need to make eating well the default," Katz says. "We need to make physical activity a default. And we need to address ... the hypocrisy of a culture where the First Lady is focused on childhood obesity, but we aggressively market French fries and Coca Cola."